August 2013. An unsuspecting farmer unleashed a plague that no-one could have predicted. They were somehow quite intelligent. They were the Sentient Zombie Space Pigs – and they are coming back! Yes, we’re delighted to announce that Issue 2 of Sentient Zombie Space Pigs will be launching on 30 August at Melksham Comic Con, one year on from the debut of Issue 1. And we can confirm that we’re holding the cover price steady at just £1. Yep, 100 pence for 20 whole pages of porcine panic, bacon brutality and downright Ham-a-geddon. Once again, dear readers, we are giving you the chance to leave your bloody hoofprint on our comic. After the success of last year’s competition – and because we can’t think of anything different – here’s The Very Same Competition! The top three quotes will feature on the back cover of SENTIENT ZOMBIE SPACE PIGS 2 and win a signed copy of Issue 2 of SENTIENT ZOMBIE SPACE PIGS. 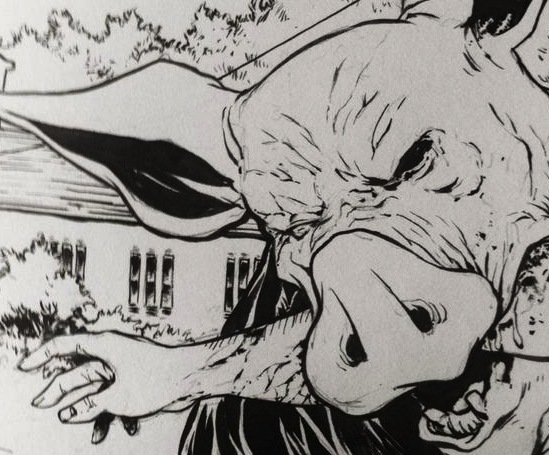 Our favourite quoter will also win a character sketch from the comic by the world’s finest zombie pig artist: Conor Boyle. Closing date: midnight on Wednesday 13 August 2014. Spread the word. The SENTIENT ZOMBIE SPACE PIGS are coming – back!